After many conversations with particle physicists and cosmologists working on particle models of dark matter, I became aware of the possibility of additional interactions on the dark sector (other than self-interactions) that could affect the formation of galactic systems. As I mentioned in an earlier post, if dark matter is 'charged' (in its own sector), then self-interactions can be understood as a Coulomb-like interaction (analogous to Rutherford scattering). The carriers of this new force in the dark sector can be thought of as 'dark photons', and thus one would also expect scattering to occur between the dark photons and the dark matter (analogous to Thomson scattering). It turns out that under the right conditions, this scattering is substantial and quite relevant in the early Universe, it provides a source of pressure that counteracts gravity stalling the growth of the primordial dark matter structures. Once the Universe expands and cools down, the probability of scattering becomes lower and the pressure vanishes. From that point onwards, only dark matter self-interactions are relevant. The phenomenon I just described is entirely analogous to what happens to ordinary matter and photons during the early Universe, it is well known and has been verified by observations, the signature of the balance of radiation pressure and gravity is called baryon acoustic oscillations. In analogy, the phenomenon in the dark sector is called 'dark acoustic oscillations' (DAOs). 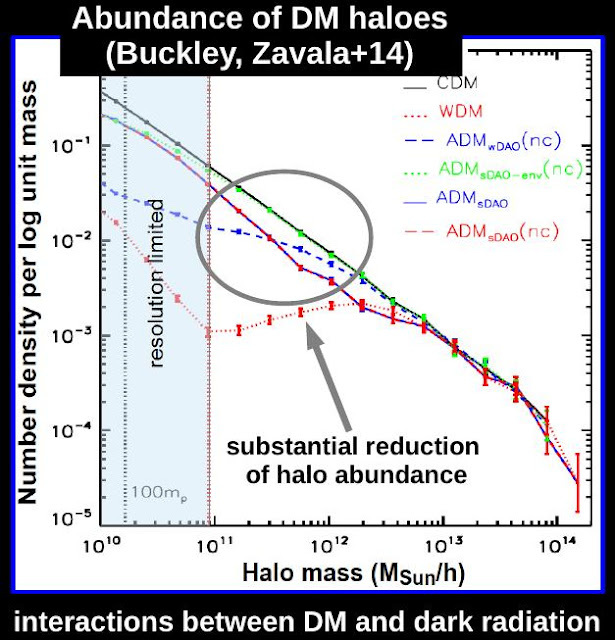 This new interaction might be a viable mechanism to supress the formation of low-haloes (more suceptible to be affected by this 'radiation pressure' since their gravitational pull is lower than more massive haloes). This in turn implies a reduction in the abundance of dwarf galaxies, which would alleviate a common problem of the CDM model that tipycally predicts a population of dwarf galaxies that is more abundant than observed. Motivated by this possibility, we have performed computer simulations of the cosmological formation and evolution o dark matter structures for models that have both self-interactions and DAOs. Our results are a proof of concept of the potential of these models to address the shortcomings of the CDM model, purely by introducing new dark matter physics. Follow this link to read all about our study in a recent paper.